You will be given a reference e-book to read which has 357 pages And the test will be based on that e-book , you can take the test only after 10 days Of purchase. What is Radical Project Management? Radical project management is a process which takes advantage of the extreme project management (XPM) approach when it comes to managing organizational projects. While the traditional project management process is known for its inward look, static nature and its inability to immediately and positively respond to constant and rapid changes, radical project management or extreme project management looks outward to clients, stakeholders and management and divulge them into a responsive process which makes an assumption that everything can change. You have to consider familiarizing yourself about this process by getting your radical project management certification since this will work in keeping the competitive edge of your organization or business. In order for you to successfully carry out a project with the help of radical project management, you should become aware of its essential elements. The first one is entrepreneurial leadership. This element requires you to instill in your team the confidence to act, think and behave with entrepreneurship for the purpose of realizing the objectives of a project. Another essential element of radical project management is creative leadership and this offers a clearer view of the opportunities and needs of your organization in the future. You have to be a creative leader if you want to act as an effective radical project manager as this can help you in quickly understanding the present needs and problems of your organization. The last element of radical project management is transformational leadership and this requires you to continue seeking for transformation. As a radical project management certification holder, you have to continue looking for ways to give your organization, your projects and the people within your team a positive transformation. Taking part in the radical project management certification program from Brainmeasures can offer you the kind of help that you need if you want to keep up with the trends and changes in the specific industry where you are in. You can expect this legitimate and ISO certified online certification company to help you learn the concepts, theories and principles behind radical project management. Enrolling in the radical project management course offered by Brainmeasures will let you experience a comprehensive training and take the radical project management exam in the end. The results of the exam will determine if you are worthy enough to receive your skill certificate. You will know more about the radical project management certification program offered by Brainmeasures by viewing its clearer and more detailed syllabus by registering with Brainmeasures. 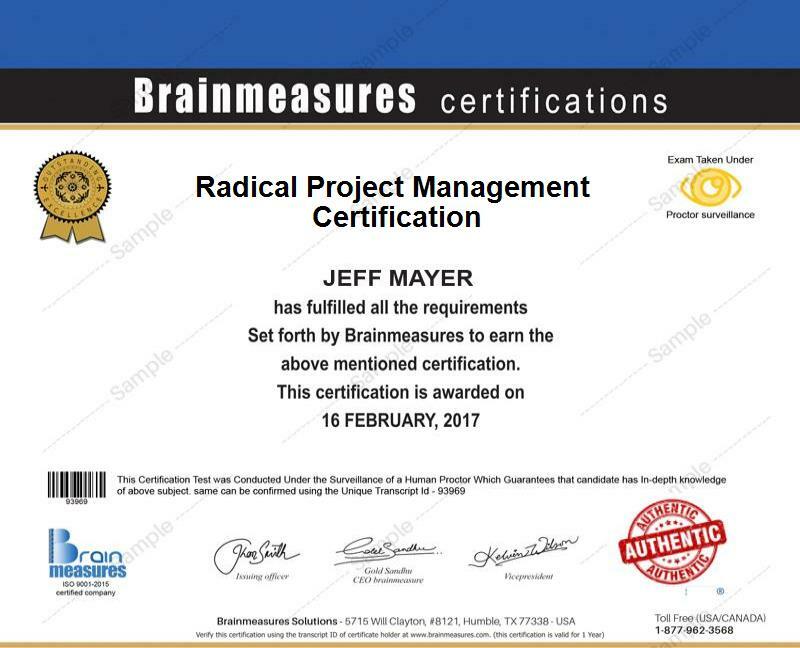 The radical project management certification program from Brainmeasures is for everyone although it is primarily designed for specific people and professionals. The certification course is more ideal for professionals, team leaders, project managers and business owners who aim to keep up with the changes in the industry while maintaining the competitive edge of their organization. Radical project management certification holders can also earn a higher pay. It is greatly possible for you to earn as much as $64,000 to $107,000 per year after you take a hold of your skill certificate.